Three of Australia's major banks on Wednesday filed a joint application with the Australian Competition and Consumer Commission to force Apple into negotiations over the installation of third-party mobile payments software on iPhone. A spokesman representing Australia's three biggest lenders, National Australia Bank (NAB), Commonwealth Bank of Australia and Westpac Banking Corp, told Reuters the banks believe Apple's restrictions on third-party mobile wallet solutions amounts to anticompetitive behavior. By filing the ACCC application, the banks seek approval to collectively negotiate the installation of non-Apple Pay software on iPhone hardware, the report said. Currently, Apple only allows its own in-house mobile payments system Apple Pay, and the corresponding Wallet app, on iOS devices. According to the The Sydney Morning Herald, the bloc wants open access to iPhone's NFC technology. "This is about providing Australians with real choice and better outcomes," said Lance Blockley, a senior advisor at Novantas speaking on behalf of the banks. "If successful, the application would have tremendous benefits for the entire Australian mobile payments landscape including for public transport fares, airlines, ticketing, store loyalty and rewards programs and many more applications yet to be developed." The complaint comes eight months after Apple Pay launched in Australia last November through a limited partnership with American Express. At the time, none of Australia's big four banks offered support for the service, and Apple continues to face staunch resistance from an entrenched local finance sector. 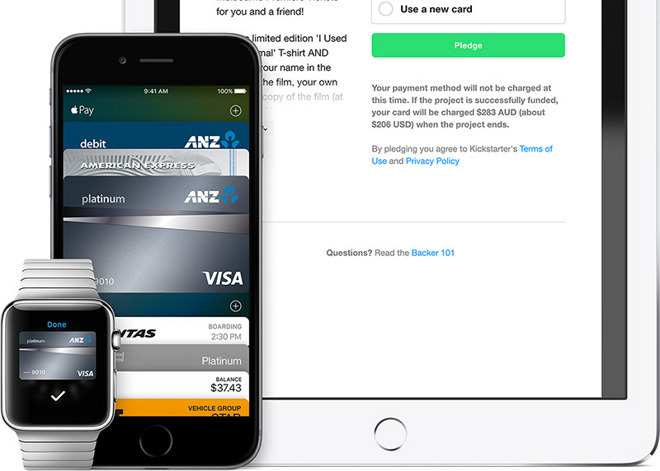 In April, ANZ became the first major Australian bank to break rank and offer support for Apple's fledgling payments service. Two weeks later the bank noted a 20 percent spike in online credit card and deposit account applications. Following that news, NAB, Commonwealth and Westpac, the three banks that filed with the ACCC today, were all said to have reentered negotiations with Apple.